The Bharata-Bharati series is available in a set of 5 CD’s. Each CD contains 20 e-books. 1) Make cheque payable to “Venkatesha Murthy” and send it to the address below. Include your postal address, phone # and email in a note. I want this CD . I want this CD in hindi languge. I am making payment for one set of CDs for RSS Jankalyan Samiti Purvanchal Vikas Samiti. Please send the set at the earliest. Rgards. Please let me know in which language are these CDS. Are they in english? Pl respond. Cds are in English. But We not yet started spiritual Bazar. We will be coming up with the same. Is there any chance we get the hard copy of these books? Also, do you have kannada ebooks of Bharat Bharati series? 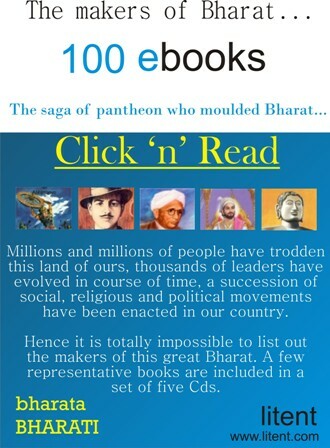 i am willing to buy each on of bharat bharati book. please let me know the details. When u start with hard copy? I need one set, can i get? 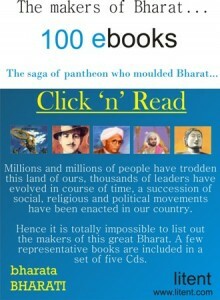 I am interested to order Bharata-Bharati series as e-books. I would like to know how many days it will take to ship to Chicago USA. You need to call Rashtrotthana Book Shop in Bangalore or other place and ask them regarding the same. we want all bharat bharati series for children and youths in marathi . if not marathi then balance in Hindi. where we can get in maharashtra? preferably at nagpur/ akola. give list with prices. I need this set of 5 cds Bharat Bharati. I am in Bangalore only. Please let me know the further process. I need the set of all the books in hard copy. how can I get.